If you"re looking for an ultra-rugged and reliable mobile receipt printer for route accounting, direct store delivery, citation printing, car rental return receipts and more, look no further than the RP Series. This tough competitor withstands drops and exposure to dust and water, and is designed for all-day printing with a full-shift battery life. A799 is the latest printer innovation from CognitiveTPG and its "champion" of the single station thermal receipt printer line. A799 is packed full of features and unique selling points that are unmatched in the market.250 mm/sec print speeds, Two Color and Monochrome thermal printing Two Color and Monochrome thermal printing, Multiple interface options (Serial, Parallel, USB, and Powered USB), Spill resistant built-in liquid dam and drainage, Steel modular frame for added strength and faster delivery, Unsurpassed reliability measurements - 60 printlines and 2.3 million knife cuts, Industry best warranty - 4 years, RoHS and WEEE compliant (Serial and USB units), Color Options - Beige, Dark Gray, Black. Small Footprint - 144 mm x 185 mm, Integrated loyalty marketing software included. Effective February 1, 2011 all A799 receipt printers come with a new 4-year standard warranty, memory upgrade (4MB), and a lower price point. The CognitiveTPG B780 is the first hybrid printer with a footprint below 73 square inches. Perfect for bank teller stations or anywhere receipt printing and drop-in validation are needed, the B780 can fit even the tightest point of sale stations. The B780 is also able to print watermarks, logos and other attention-grabbing imagery on both monochrome and multi-color thermal paper. 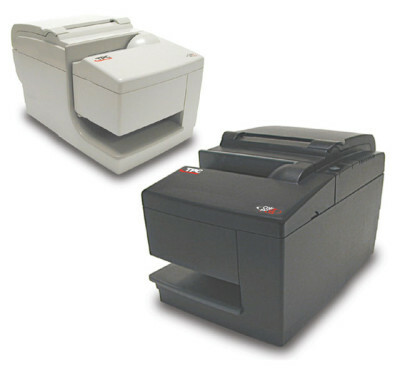 The A760 is one of the fastest and most accurate two-color printers available. With integrated capabilities like MICR and check flip the A760 has the combination of user friendliness and superior printing capabilities. One color models of the A760 are also available. A799 is the latest printer innovation from TPG and its "champion" of the single station thermal receipt printer line. A799 is packed full of features and unique selling points that are unmatched in the market.250 mm/sec print speeds, Two Color and Monochrome thermal printing Two Color and Monochrome thermal printing, Multiple interface options (Serial, Parallel, USB, and Powered USB), Spill resistant built-in liquid dam and drainage, Steel modular frame for added strength and faster delivery, Unsurpassed reliability measurements - 60 printlines and 2.3 million knife cuts, Industry best warranty - 3 years, RoHS and WEEE compliant (Serial and USB units), Color Options - Beige, Dark Gray, Black. Small Footprint - 144 mm x 185 mm, Integrated loyalty marketing software included. Effective February 1, 2011 all A799 receipt printers come with a new 4-year standard warranty, memory upgrade (4MB), and a lower price point. The TPG B780 is the first hybrid printer with a footprint below 73 square inches. Perfect for bank teller stations or anywhere receipt printing and drop-in validation are needed, the B780 can fit even the tightest point of sale stations. The B780 is also able to print watermarks, logos and other attention-grabbing imagery on both monochrome and multi-color thermal paper.